Extremely extended high frequency response is essential for precision digital transmission, as it is for analogue and visual signal transmission. This is the new generation reference cable for digital, analogue and visual transmission. Digital signal is a composition of simple "1" and "0" values, however the important fact is that it is transfered into pure analogue signal in square wave at very high frequency form for transmission. Therefore, it requires a high quality cable, particularly with the ability to transmit distortion free, extreme high frequency signals. Acrolink has always paid extra attention to this fact, and has developed a special cable for distortion free digital transmission which is also superb for analogue and RGB video signal. Conductive cores are made from high purity 6N copper. We chose densely twisted 19 strands of 0.26mm diameter wire following numerous trials, measurement and auditions. PTFE Teflon tape was chosen as the insulator for its high insulation factor and sound quality. It is wound around the conductor to optimum thickness and further covered with cross-linked polyethylene. Perfectly constant distance between the conductor and the shielding layer is important for stable signal transmission.This structure is also effective in controlling distortion from unwanted resonance. Double layer shielding with copper foil and braided silver plated copper provides perfect shielding and the outer cover is of the highest quality UV resistant polyurethane for further resonation damping and ideal fexibility. Acrolink also developed new connector plugs of the highest quality. 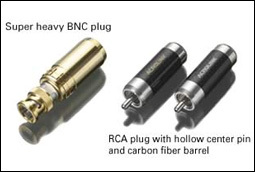 RCA plug: the main body is precision machined from iron free phosphor bronze for the most secure contact with long life. The center pin is hollow to increase surface area, thus achieving wider range transmission, and is plated directly with extra thick rhodium. The carbon fiber outer case absorbs EMI disturbance and also suppress resonance further. 6N-D5070 is fitted with our own BNC plugs with precision machined 4N solid silver center pin and machined solid brass connector body. PTFE Teflon is deployed as the insulator and the outer casing is machined solid ECOBRASS, which is super heavy and has superior vibration damping characteristics.